My husband has been on call working from home this week. His co-worker Fernando misses my food every time my husband works from home. 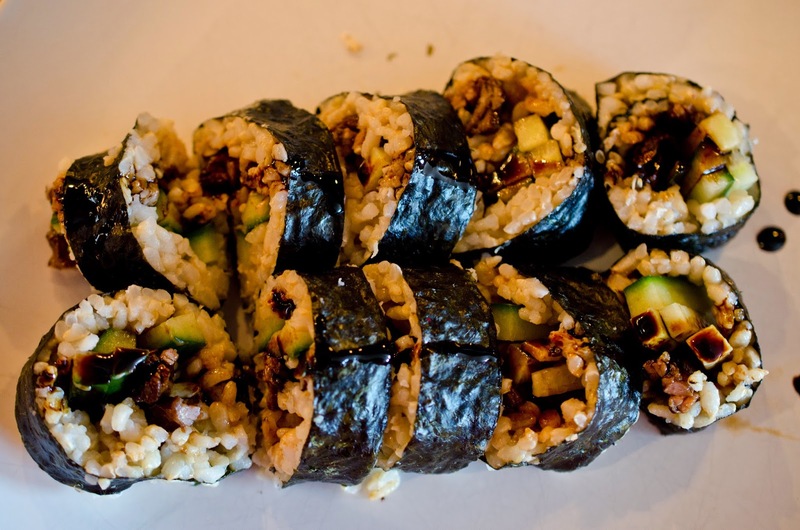 Today Fernando wanted sushi rolls for lunch, homemade and from a nearby restaurant. My husband's lunch break isn't long enough for a visit to the office for lunch or a restaurant. Instead of eating out I made some sushi rolls at home. I had to get creative and create a roll based on food I already had. The good news was, I had left-over steamed brown rice from last night's Indian dinner and steak in the freezer. Teriyaki sauce is so yummy, so that was also part of my plan. This is a throw it together roll, at least it is for me. The sauce and flavor were out of this world yummy. in the mixture for 20 minutes. 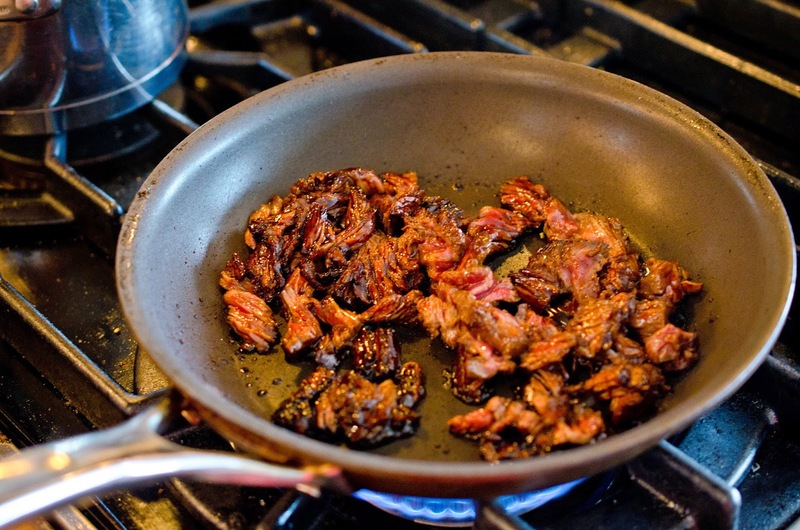 Place a 12 inch non-stick skillet over a medium-high heat. 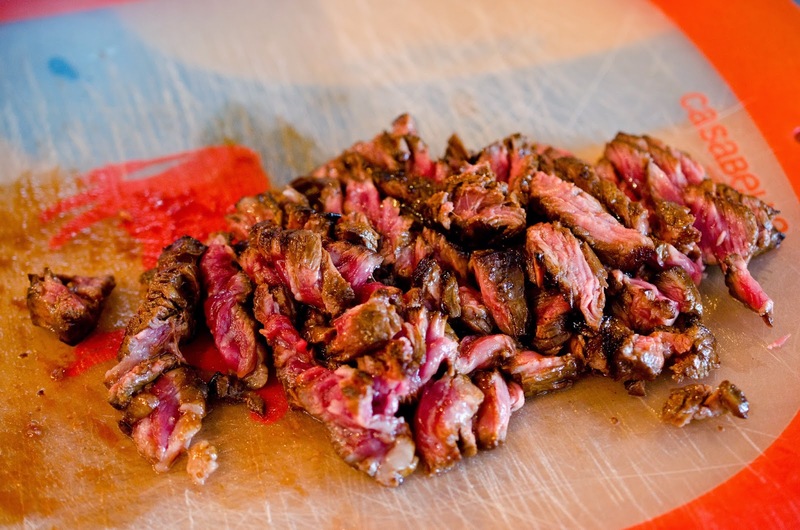 Add steak and enough of the teriyaki marinade to coat. 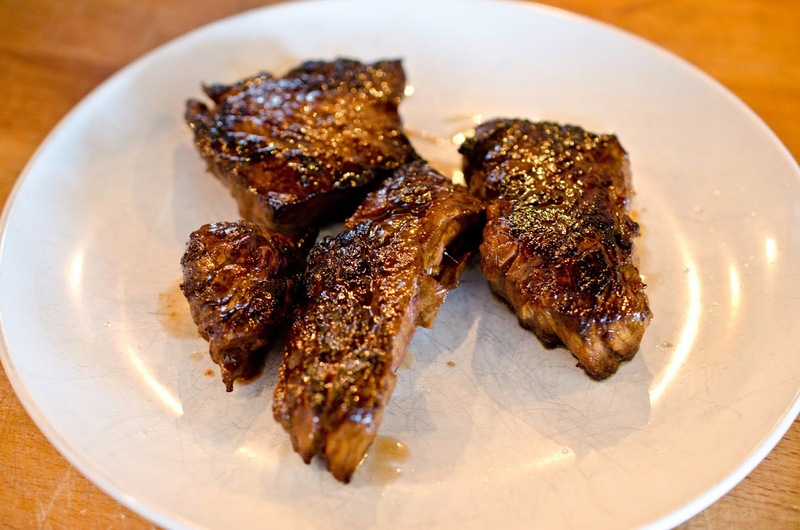 Cook steak very quickly, slightly crisping the edges and remove from the heat. 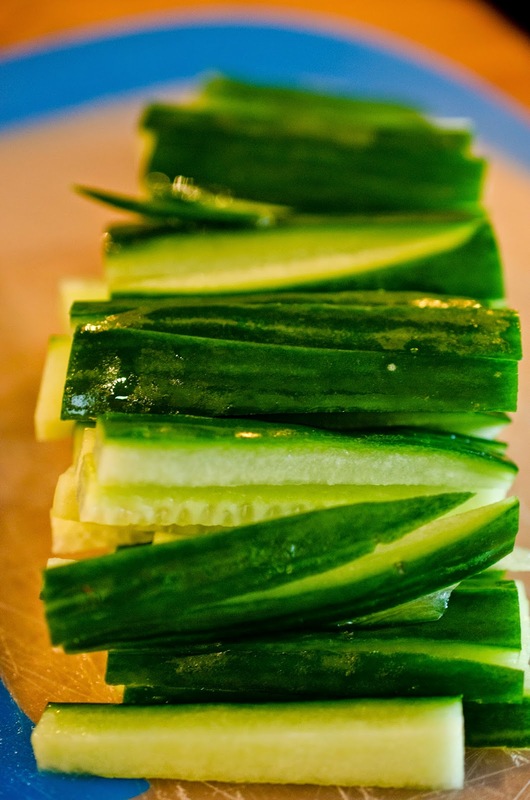 Wash and cut cucumber into 4 equal pieces and julienne the pieces (cut small sticks). 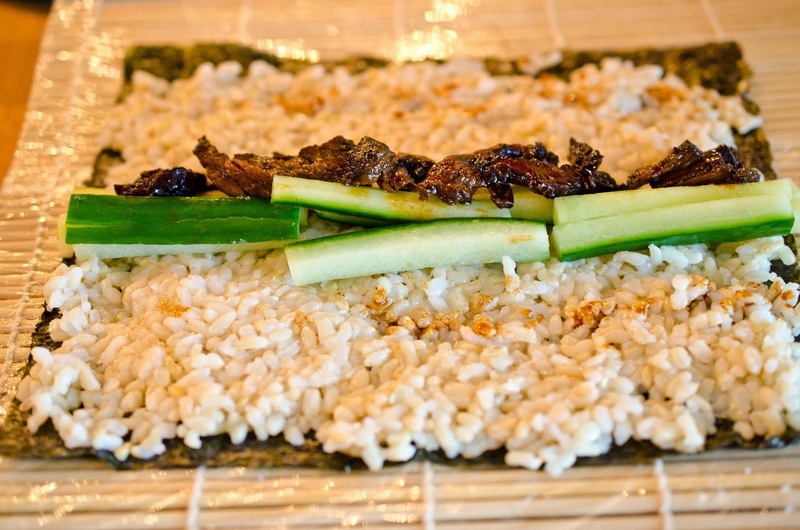 Place nori sheet on prepared sushi mat. 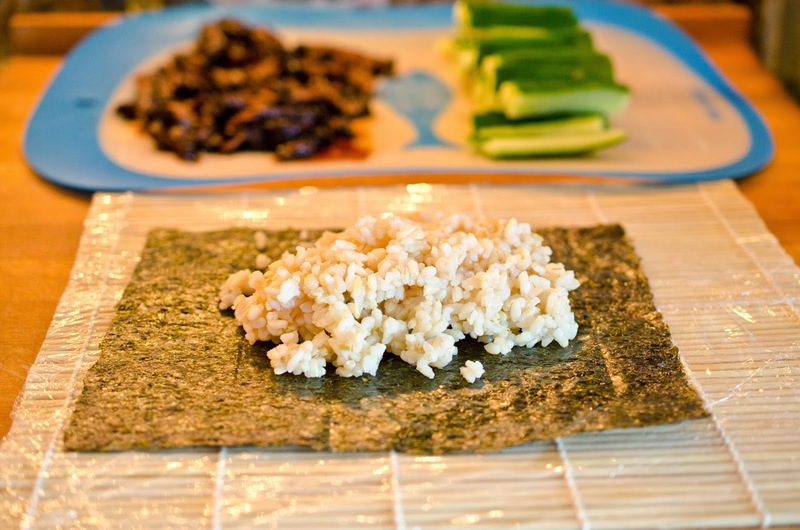 Put a softball size mound of sushi rice on nori sheet. strip in the middle of the rice. 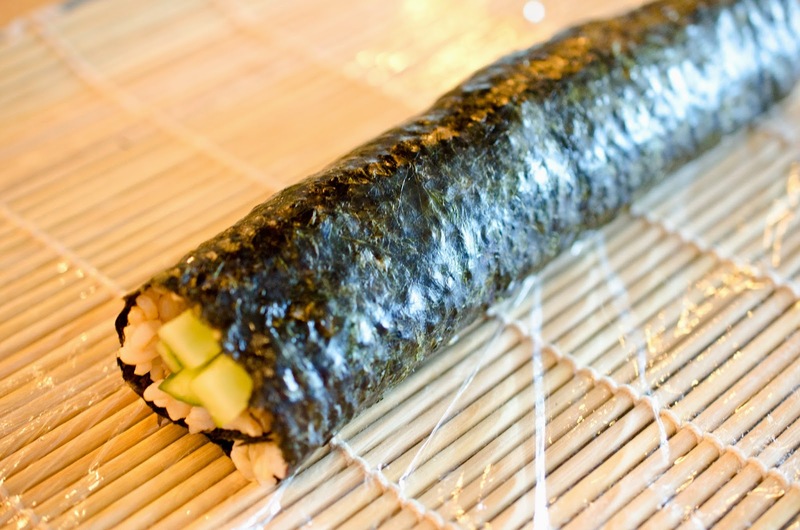 Carefully roll as tightly as possible. I'm still working on rolling tightly, so I'll need more practice. Darn I have to make more of these. Using a very sharp knife and a sawing motion cut the roll in half. roll thickness. Spoon on extra teriyaki sauce. eat them all when they are made. 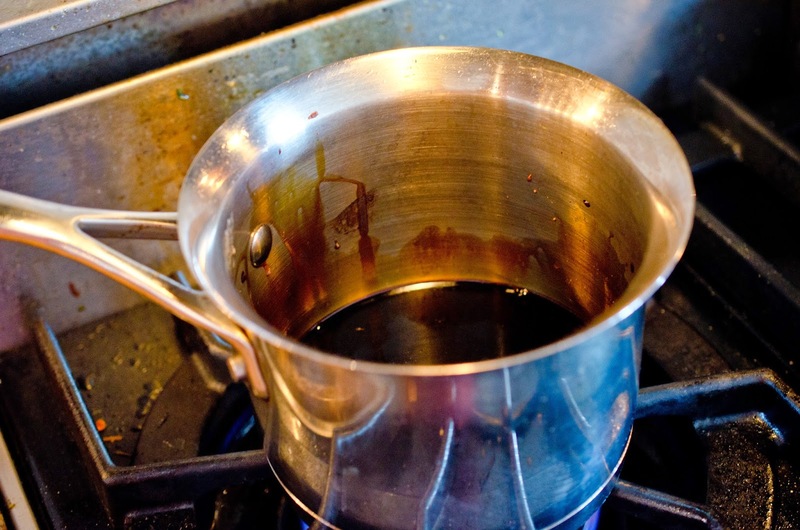 Mix 1/2 cup soy sauce, 1/2 brown rice wine vinegar, 1/2 cup cane sugar. 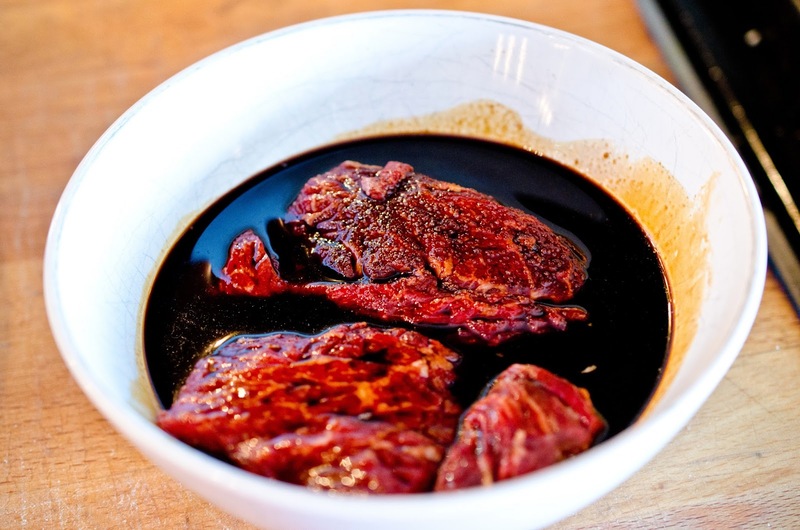 Marinate the beef in the mixture for 20 minutes. Heat a 12 inch skillet over high heat. Add 2 tablespoons vegetable oil. Quickly brown the steak on all sides. 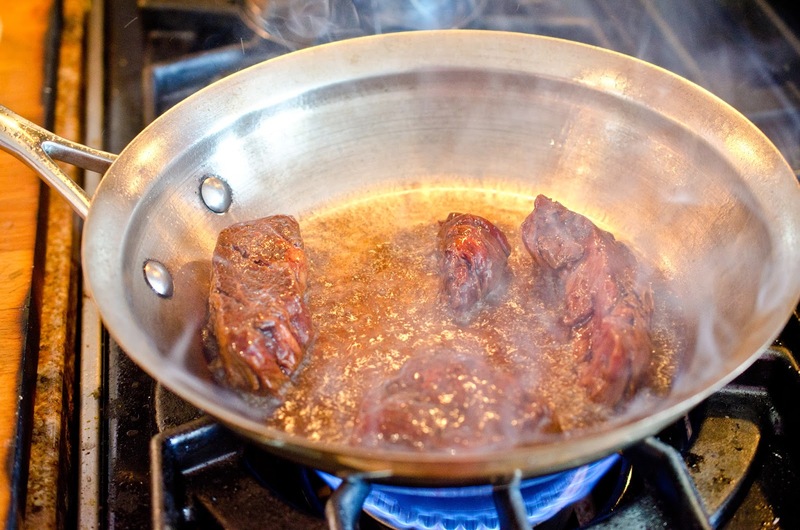 Pour marinade into small sauce pan over medium heat and reduce by half. When it boils lower heat to low. Wash and cut cucumber into 4 equal pieces and julienne this pieces (cut small sticks). Flatten rice using your hand wrapped in plastic wrap. (My friend Bridget taught me this trick.) 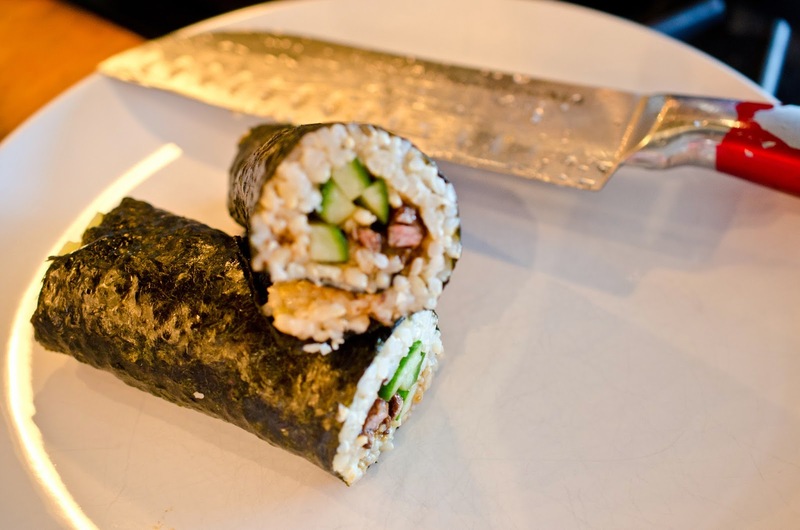 Leave the far 1/2 inch edge free of rice. 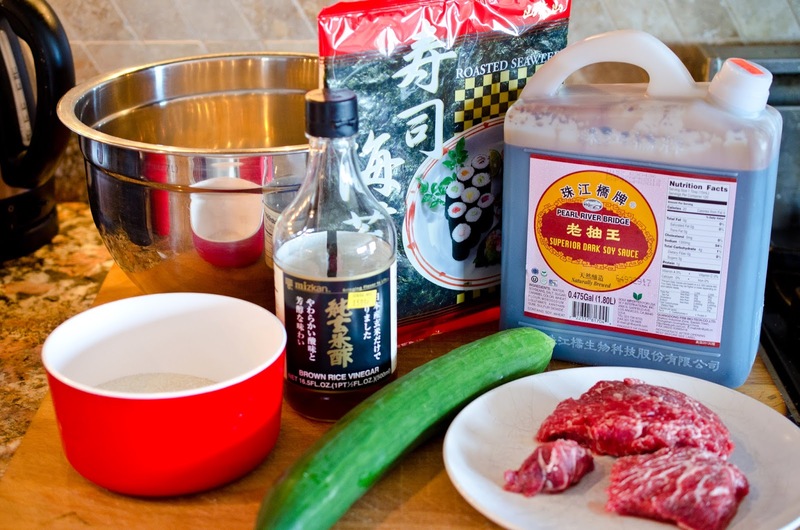 Place 9 cucumber sticks and teriyaki steak in a long strip in the middle of the rice. Carefully roll as tightly as possible. Place roll halves together and again with a sawing motion carefully cut into your desired roll thickness. Spoon on extra teriyaki sauce. Since these do not contain anything that can go bad, they are great as leftovers, if you don't eat them all when they are made. I love that you reduced the sauce. The sweet/sour/teriyaki combination sounds amazing too.